Writing about a book I've read is a challenge, as I have to keep myself from spoiling the whole story to you. You need to excuse me for being too excited to tell about my latest read. Lovestruck in London is about Lizzie Medina who went to London for a master’s degree. She thought this was a great opportunity to finally be away from home, and reinvent herself as she has always been the little baby sister in her family and never been outside of their town. With this opportunity, Lizzie thought she would finally get the chance to explore a different country and work on her dream of writing her own book instead of going through her family’s predestined plan of her life that’s been laid out for her – which is to become a teacher just like her sisters. One day she unexpectedly met an incredibly cute guy – Thomas Harper; an upcoming actor, fell in love with him, and he later exploded and became a superstar. Lizzie is now forced to figure out if this is really the life she wanted. As her study in London was about to end, she had to make a decision whether or not to continue her relationship with Thomas, and whether she’d stay in London or go back home. I have to admit to you it was so difficult for me to close this book. I had to continue reading until it was finished. I love Lizzie and Thomas’ beautiful story and how they both love each other so much. After I finished the book, I still kept thinking about them, as if I too was in their world. Yes, I am a true romantic! I downloaded this book and I did not regret it. This is the first installment of the Lovestruck trilogy. Get to know the author Rachel Schurig and her works by visiting her website. 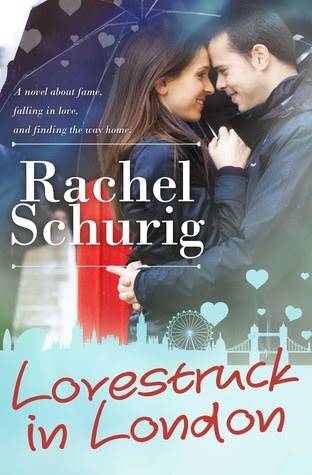 You can download the Lovestruck in London by Rachel Schurig here. Have you read Lovestruck in London? What was the latest book you’ve read? Thanks Anett, you should read it too. You will love it. I love books that have to do with travel (especially to London) and romance. Your post made me want to read the book that I literally just bought it. Hahaha! have a lovely day!